March 12th I kissed goodbye my beautiful male "Mighty". Just shy of 8 years old, he gave me all the love and devotion. He "LOVED" everybody, everything, except those nasty geese that would fly over his head. He would lick you to death and sit patiently for the next cookie or ice cream. He was my dwarf Pyr's hearing. She looked to him to provide her the signs that we were home, or better yet, something good was to eat...They were best buddies. Although, I've had Pyr's for probably 20 years now, losing those you cherish is never easy. People have asked "Why do you keep having them?" The answer is simple - "The tears I shed at the time I have to say goodbye, does not match the tears of joy that these dogs have given me through out the years". He will be truly missed. 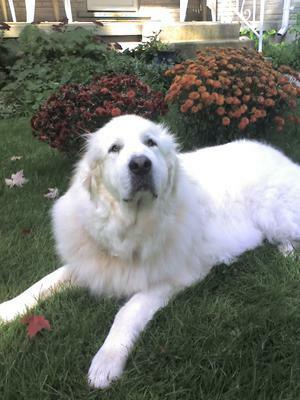 There truely is no way to ever get over the loss of a great Pyrenees. They become part of the fabric of your soul. How ever there are only two ways of trying to cope with this deep lose. One I know works and that is to honor him or her by putting all your love into another. It honors his memory. The second way I think would work but will have to wait to find out. That is when it is time may I meet him at the rainbow bridge. Where we will once again enjoy each other forever happy. I hope these thought can lessen your pain. God bless you and help you find peace. Well said. It's unfortunate people wonder why people continue to get another dog after one passes. Yes, it's because they bring us such joy and what better way to honour a companion who has gone to the bridge.